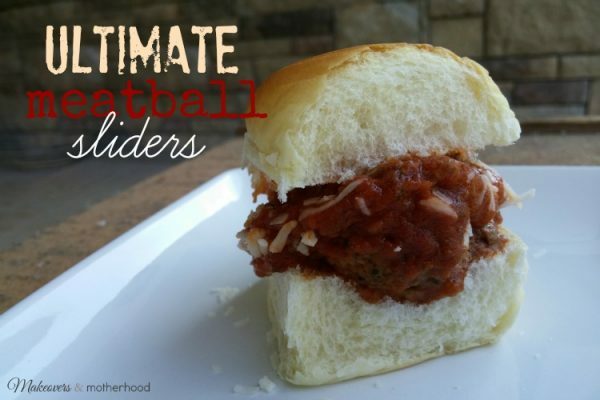 Whether you’re looking for a perfect crowd pleaser for Super Bowl or just trying to please a picky eater, these meatball sliders are a huge win! And that’s huge for me. I would never EVER chose to eat a meatball sandwich until now, but I can’t get enough of these babies! So it all started when we were on vacation and hubby ordered a super snazzy meatball slider which he raved about. The next week, my Kindergartner (who always takes a packed lunch to school), in great detail describes the meatball sandwiches that you can choose when you have a school lunch. So to make him happy, I thought I would combine the two… the meatball sandwich with the ease of eating it as a slider. Luckily, my oldest son had picked out the mother load package of King’s Hawaiian sweet rolls when we were at Costco. So we had the perfect base for the sandwich! Then with only 4 other ingredients, 5 minutes of prep and 35 minutes of cook time, the best, most delicious, mouth watering, ultimate meatball slider ever was created! It’s no exaggeration… it really is that good! In fact they’re so good, our picky 3-year old has asked to have these as leftovers (twice). And we will be adding them to our menu as a regular! Want a really good side to pair with it? Try our Cinnamon Sweet Potato Home Fries! YUUUUUUM!!! Okay, if I don’t stop talking about it, I’m gonna have to go warm myself up a late night meatball slider snack! So, let’s get cooking! In a large bowl, combine ground beef, cheese, and Italian seasoning. Roll mixture into balls (approximately 2.5" diameter). Place in glass baking pan. Cover meatballs with pasta sauce. Bake for 40 minutes at 400-degrees. Cut Hawaiian rolls in half. Place one meatball on each sweet roll. Spoon on extra sauce, if desired. For kids, cut meatballs in half before placing on sweet roll. 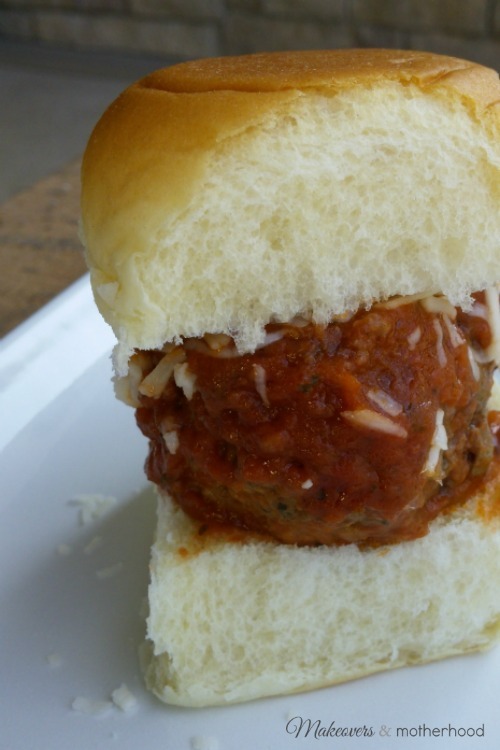 One meatball cut in half to make two sliders is perfect for kiddos.